GoXtra News: MTN BUSHFIRE GOES CASHLESS! With just a few days to go until the start of MTN Bushfire 2018, all guests are reminded that the bars and food vendors at this year’s festgival are now cashless. All ticket holders will receive a unique coded armband that will be linked to a personal account that you can add to throughout the festival. This tap-and-pay system will alleviate many of the long queues at the bar and add to the overall MTN Bushfire experience. 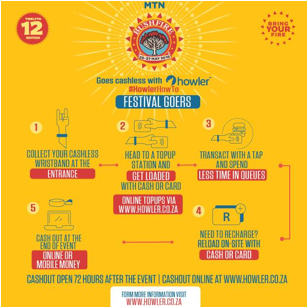 Topping-up during the event, that is also easy – simply head to one of the Howler Loading Stations at the event with cash or a credit card and add as much as you like to your arm band account. This tap-and-go system will ensure that you spend less time in queues and more time taking in the MTN Bushfire experience. Alternatively, you can load credit at our top-up station during the festival. Cashout to any South African bank account and receive the funds within 2 workings days. Non SA bank account holders who have accounts with the following banks in their coutnries can also tapu out directly to their accounts: FNB, ABSA, STANDARD BANK & NEDBANK. Be notified when online cashouts are open, generally 48-72 hours after the event. Every year around 26,000 music fans from across the globe gather in the scenic Malkerns Valleys of Swaziland to experience the internationally acclaimed event. More than simply a music festival, MTN Bushfire is a holistic experience made up of a rich texture of arts, cultures, crafts, food and people, carefully curated into specialized zones, to create an explosive three-day event and a memorable take home, family–friendly experience. Celebrated for its uniquely African yet global offering, the MTN Bushfire line-up will once again include some of Africa’s top artists as well as a host of artists from across the world. Stay tuned for more exciting artist announcements over the next few weeks.